Just over 1000 years after the night they invented champagne, I sat in on a Saturday matinee of Lerner and Loewe’s Gigi. Playing the eponymous protagonist was Vanessa Hudgens, who started the show stomping about the stage, singing, “I Don’t Understand the Parisians,” bemoaning the broadness with which the people pursue l’amour. She may not hail from the City of Lights — born instead in far-north Saint-Pol-sur-Mer — but Kristina Mladenovic shares a certain French fascination with aesthetics. “It’s true that I have this ability as well to hit strong forehand and backhand, but I actually am bit different,” she told press after beating World No. 3 Simona Halep in Birmingham. Watch Mladenovic play several sets and one wouldn’t immediately assume “variety” was on the menu, even as a plat du jour at Maxim’s. Armed with a fearsome serve and a fearless forehand, the 22-year-old hit through a trio of talents to reach the semifinals of the Aegon Classic, but was most impressive against the aforementioned Romanian. Out-gunning Halep to level the match, she out-gutted the top seed in a final set tiebreak, crushing a forehand return into the corner on match point. Mladenovic certainly cast a few spells of her own on Centre Court, bewitching Halep with a bevy of drop shots, none more audacious than the one that started the sudden death, setting the tone towards the upset. The frequency and accuracy the dropper surprised even the semifinalist herself. The breathless change hardly came overnight. Mladenovic emerged on the scene six years ago, capturing the girl’s singles title in Paris and falling in the finals of London. Playing Noppawan Lertcheewakarn, her struggles at style were far more funny and awkward, lacking the deftness and comfort she has come to find on her favorite surface. “I always enjoy playing on grass. I just think I was a bit unlucky last year. I remember playing really well in ‘s-Hertogenbosch, but I lost a very close match in three sets to CoCo Vandeweghe who afterwards won the tournament. So I was like, Okay this is not that bad. “Then I arrive in Wimbledon and lost first round to Diyas that had afterwards a really great run into the second week of Wimbledon. One year later and that sparkle has turned to fire; struggling with her rhythm through multiple rain delays, Mladenovic still had eventual finalist and good friend Karolina Pliskova on the ropes in the semis, holding a 6-3 lead in the second set tiebreak. With one week between her and Wimbledon, the World No. 37 has opted to only enter the doubles in Eastbourne, a set-up that suits the Frenchwoman just fine. “As you probably know, I’m also a great doubles player,” an imperious reminder of a resume that speaks for itself. 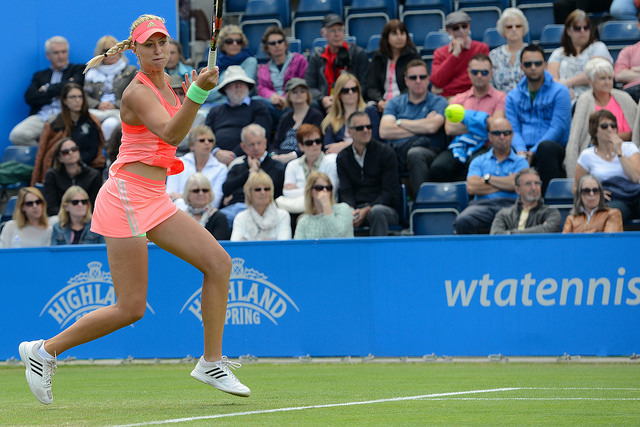 Though singles wins had been hard to come by on grass, Mladenovic has been virtually peerless with a partner. One day after watching Marion Bartoli capture Grand Slam glory in 2013, she matched Daniel Nestor to win her first major title in mixed doubles. Just last year, she and Timea Babos took out top seeds Hsieh Su-Wei and Peng Shuai to reach the women’s doubles final. “I always knew from the beginning of the my career I started doubles as the best practice for my singles, and I’m really happy to be in all these situation and be ready. Helping to mold Mladenovic’s attempts at an all-court game is younger brother Luka, who has been coaching Kristina through his own off-season as a footballer. Both born of athlete parents (a volleyballer mother and a handballer father), brother and sister are keenly attuned to the pressures of competition. “I don’t have any coach for already a few months right now. I just thought it would be fun to have my brother. We always have fun, we talk, but he’s also very serious. He’s maybe younger than me, but also used to play really good tennis before choosing football. 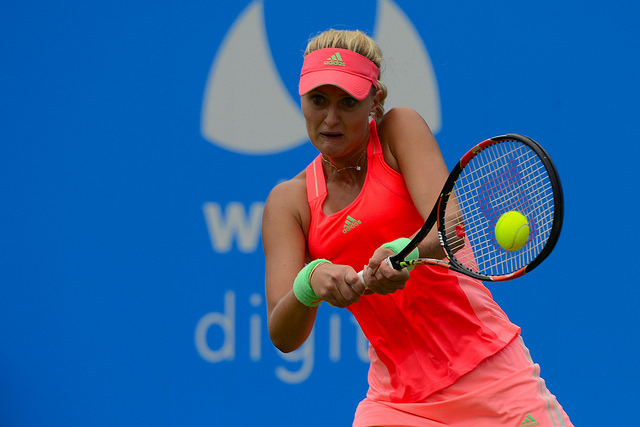 With a game coming together on the grass, Mladenovic hopes her humility will take her onward and upward.